← Amazing Amex Offers for AmexTravel and Hilton bookings. From September 1st through December 31st, 2017, you can earn extra points for purchasing nights, staying and purchasing points at Intercontinental Hotel Group hotels around the world. 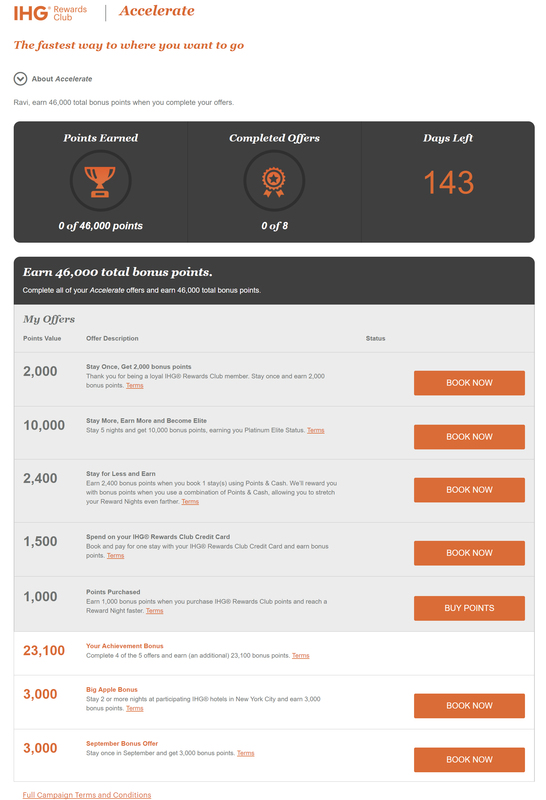 The IHG Accelerate offers differ between each account and the total points earned can also differ vastly. Here is my offer. You can find out what offers and points to by registering with IHG here. This is a fantastic promotion that I am glad IHG continually offers. It also can run concurrently with other promotional offers from IHG for extra points earning. You can read the terms and conditions at IHG.com. If you received a different offer, please let me know in the comments below.